Nature-based solutions enhance and work with natural habitats to help people adapt to the effects of change and disasters. Key examples include the restoration of coastal ecosystems to protect communities from storm surges and erosion, agroforestry to stabilise crop yields in drier climates, and forest restoration to regulate water supplies and protect communities from flooding and landslides. Despite this, nature-based solutions are not being implemented across the globe, and they receive little funding. There are three major reasons for this. First, evidence for the benefits of nature in a changing world is very scattered. Second, there is a lack of knowledge exchange between scientists, policy makers and practitioners: too much ecosystem science is done in isolation from the end-users, and too many adaptation policy decisions are made without considering the science. And third, more broadly, there is a general lack of appreciation in business and government of our fundamental dependency on nature, especially in a changing climate. 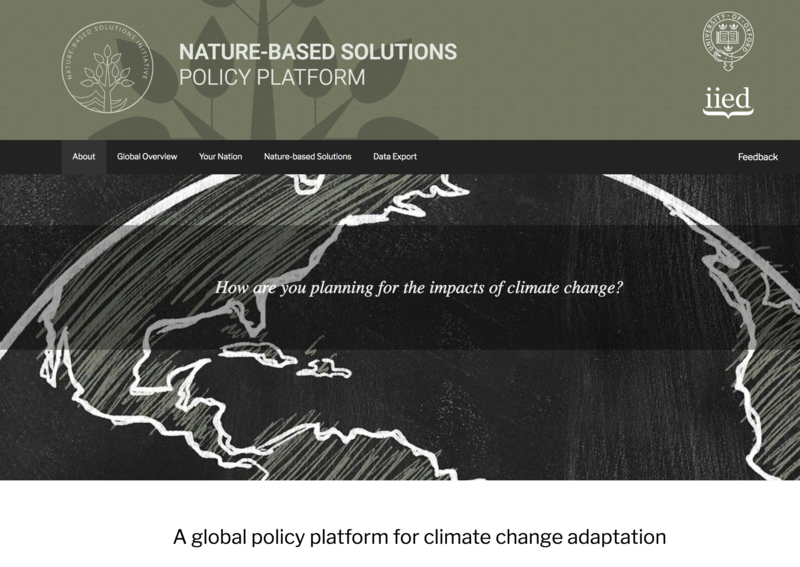 The Nature-based Solutions Policy Platform aims to address these issues through making information about climate change adaptation ambitions and the use and potential of nature-based solutions across the globe openly available, easy and interesting to explore. The platform will grow with more policies and functionalities. Please let us know how we can make it most useful to you - contact Natalie Seddon at nathalie.seddon@zoo.ox.ac.uk or leave a comment below.